I have been recently researching Gnosis ahead of the announced auction on the 24th of April. One of the frequent questions that people ask is “How does Gnosis compare to Augur”? I have not found a good impartial comparison, therefore I am writing this. This is by no means complete or finished overview. When I find more time, I might gather more details and fill some gaps. Thanks to Martin Köppelmann, Stefan George, Joey Krug, Stephen Sprinkle, and Griff Green for review, factual check, and suggestions for corrections and additional points. I did not give them a lot of time to review though, because the draft version was ready only a few hours ago. Still, it was up to me to choose what to publish, and all opinions and possible factual mistakes are my own. Both teams have been in existence for couple of years, and both have been iterating over concepts of prediction markets and engaging with the community during that time. I had a brief in person encounter with Martin of Gnosis and Joey and Jack of Augur at DEVCON2 in Shanghai. During their iterative development, and while trying to implement a prediction market platform on Ethereum, both projects seem to have converged to some core concepts. 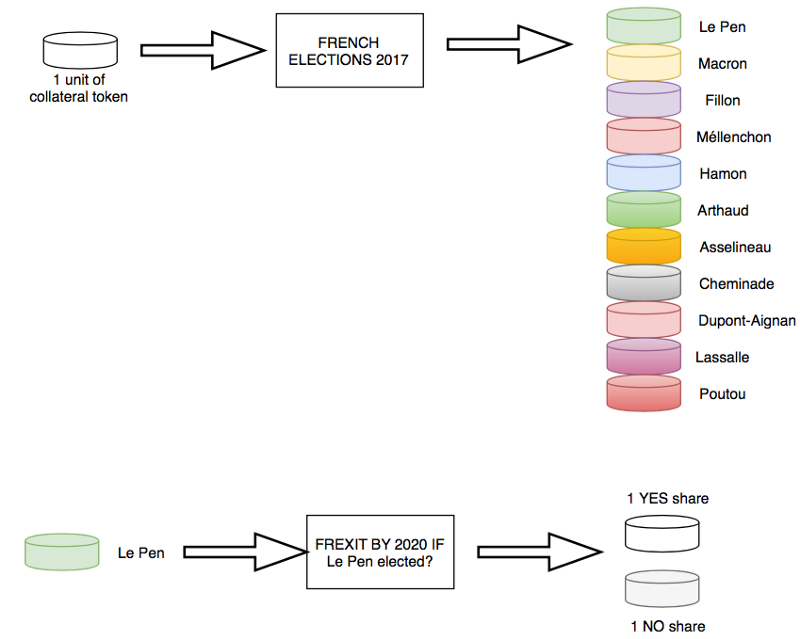 Both platforms support 3 types of events: Binary (outcomes are YES and NO), Categorical (there are multiple discrete outcomes, for example, winning candidate in an election), and Scalar (there is a Lower and Upper boundary defined for such an event). In the current implementation, Augur allows ETH to be used as collateral tokens, and Gnosis lets one specify the collateral token as a parameter when a market is created. Note that these two operations can be performed at any time, regardless of any oracles or prices at the market. Currently, Augur does not charge a fee for such operation (though gas cost needs to be paid), and Gnosis currently charges zero fees, but the plan is (deducted from the code) to charge fees in WIZ proportional to number of shares bought or sold. Market resolves through decision of the corresponding oracle. Currently, both platforms let one specify the oracle (as a smart contract of certain form) for so-called “fast resolution”. Also, both platforms have backstops, for the case if someone disagrees with the result of the fast resolution. Backstops will be described later. You can see that regardless off the resolved value, the sum of payoff of any complete set is always 1 unit of collateral tokens. In Augur, the ownership of outcome shares is currently recorded in the data structures of the smart contracts, and transfers are tightly controlled by the trading functions. This allows Augur to collect fees whenever the shares are traded (i.e. amount of fees is proportional to the trading volume). Fees are currently collected in ETH, and are specified as a parameter when a market is created (default suggested values are 1% for makers and 2% for takes). These fees are split 50/50 between the creator of the market and the REP holders who happen to participate in the resolution. In Gnosis, on the other hand, the outcome shares can be “detached” in the form of ERC-20 tokens, and traded elsewhere (however it is still possible to trade them directly on Gnosis). This allows for liquidity to be moved around and aggregated in various unpredictable and interesting ways, but makes it hard/impossible for Gnosis to collect trading fees. Creator of a market can make their market more attractive by adding initial liqudity. 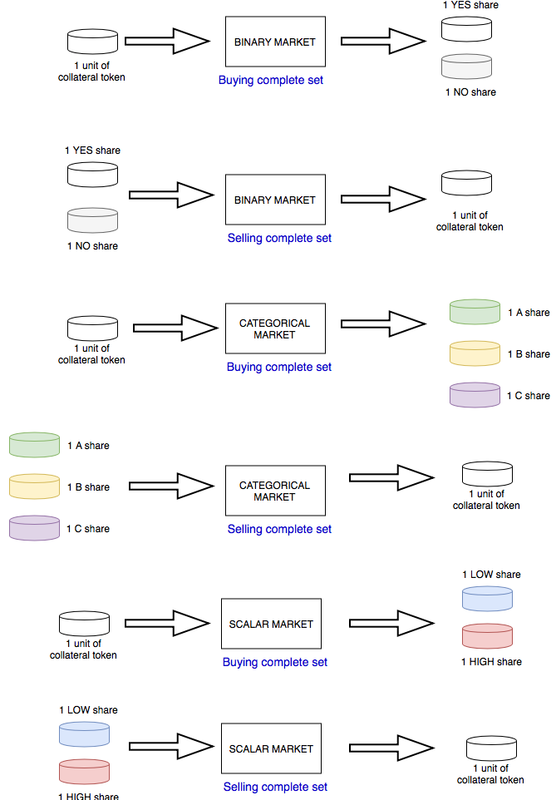 Initial liquidity is given in collateral tokens and is used to buy some complete sets of outcome shares. In Augur, these shares are then placed in the order books around what the creator believes is the current fair price. In Gnosis, the creator attaches a market-maker contract. That market maker automatically determines the price at which an outcome share can be bought from or sold to the creator of the market. Currently, one of the sample market makers provided on the github is LMSR market maker. Both platform experimented with this. Augur initially planned to use it as a basis for allocation of the initial liquidity (this is what happens in Gnosis if you choose the LMSR market maker), but later on they pivoted to the more direct control by the market creator. Logarithmic Market Scaling Rule tries to price outcome shares depending on how abundant (price is less) or scarce (price is more) they become. Both platforms explore the possibility of off-chain trading, and both mention State Channels as the most probable solution. If “Faster” resolution got challenged (via placing a bond), a subset of REP holders is randomly allocated to report on the outcome. Reporting is happening in 2 phases: commit and reveal. Decision of the majority of holders is taken as the resolution. If the previously described resolution got challenged, all REP holders get to report on the outcome. Again, commit and reveal phases, majority decides. Decision of the majority of REP holders can be further challenged by requesting a fork of REP token. In this case, the payouts will be delayed, until the market liquidity for the next 2 months will ultimately decide which fork is more popular. Note on hard forks: There could be another potential escalation step in Gnosis, which is being pointed out by Joey: Ethereum Hard-Fork, which is the only higher arbiter that can overrule the Gnosis Ultimate Oracle. I have not had enough time to think about how such hard fork would work (i.e. what exactly would need to be reverted), if this is indeed possible. Note that the presence of the Oracle backstop and its perceived fairness is the main reason why someone would create markets on Augur/Gnosis and not on a copy-cat platform (because Augur’s or Gnosis’s Oracle will not have any reason to resolve copy-cat markets). From technological point of view, the projects are very similar and have converged on lots of similar ideas. This is understandable — both teams spent considerable amount of time and effort developing their platforms on Ethereum, bumped into a lot of constraints, and a lot of common solutions seem “inevitable”. Economic models are different. In Augur, the outcome shares do not currently leave the marketplace, and it allows Augur to charge fees proportional to the trading volume, and channel them to the REP holders who report. In Gnosis, the fees collected are proportional to the outstanding shares (charged at the point of buying or selling of complete sets, as well as taking liquidity from the market maker). It is impossible to say which model will become more lucrative for REP and GNO holders respectively. It might be that higher liquidity elsewhere will cause Gnosis outcome shares to be produced in great numbers, or conditional markets become very popular. 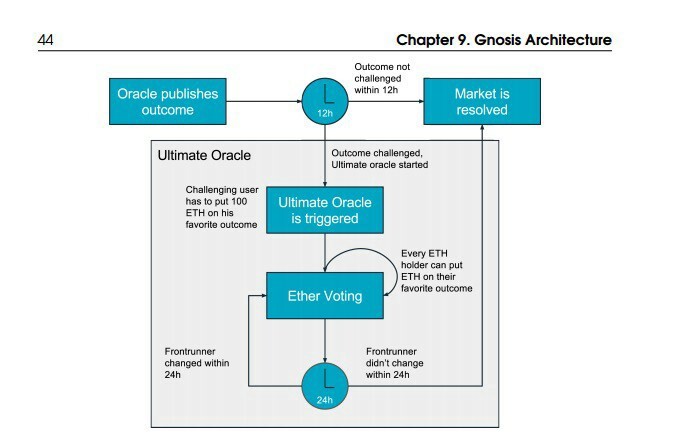 In my opinion, the Oracle backstop used in Augur looks more plausible. It has some features of Proof Of Stake, with similar notion of selection weight, slashing, and subjectivity (via REP forks). It might be possible, however, for Gnosis to use the Augur Oracle backstop as a plugin.